Safeguarding your RV investment with the purchase of an extended service contract can be a great step towards protecting your budget, but it takes a lot of education to feel confident in your purchase. We feel strongly about providing the proper resources so RVers can discover the best value possible when it comes to price and coverage for your extended warranty. We’ve created this three-part blog series, “Decoding Your RV Warranty Policy”, to help you master the RV protection language, and choose a coverage option with confidence. First, we’ll review what we’ve learned about RV extended warranties so far. What is commonly referred to as an RV extended warranty is actually an extended service contract. Within that contract, you will find exclusionary or comprehensive coverage. These two types of coverage indicate what is and is not covered by the contract, with exclusionary coverage representing the most comprehensive option. The provider of either coverage should be backed by an insurance company to ensure your claims will be paid no matter the status of the company you purchased the policy from. Additional terms to know include service call, prior authorization, and consequential damage. Miss the first post in the series? Start from Part I: Basics. Pre-purchase inspections are essential to a smooth repair process on your rig. Having this service conducted prior to initiating your contract will protect you from an administrator denying a claim as pre-existing. This becomes increasingly important as your home-on-wheels ages, considering the chances of your rig having a breakdown is 80% by the fifth year and nearly 100% by the eighth. With the cost of parts running nearly double the labor cost, you’ll want to ensure someone is on your side throughout the claims review process. These experts will notice if costs requested are outside of industry standards, and ultimately have the claim amount paid in full for covered repairs. Miss the second post in the series? Start from Part II: Repairs. Now that you know the RV extended service contract essentials, we’ll take it one step further with Part III: Coverage. RV extended warranties can differ in coverage, price, and overall effectiveness depending on what you’re looking for. It can be difficult to know what to look for within the policy, as there isn’t a one-size-fits-all coverage that makes sense for every RVer. 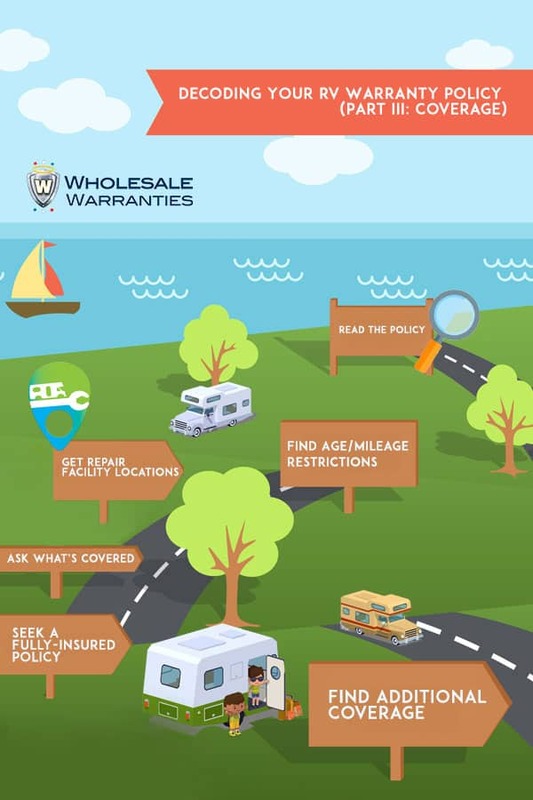 Finding the best RV warranty for you should be as easy as asking the right questions of your salesperson. Knowing exactly what to ask, however, can be difficult. As RV extended warranty experts, we’ve devised a set of simple questions to ask your warranty representative, or sleuth yourself, prior to buying an extended service contract. Suitable answers to these inquiries will ensure your policy is tailor-made for you and your rig. Ask for the policy upfront. You’ll want to conduct research on your own before making a final decision on a policy, and the only way to do this is with a copy of the contract you are considering. Reading through and fully understanding your contract is the first step in ensuring the policy you are purchasing is going to cover what you need in a pinch. Make sure the provider is willing to walk you through all types and levels of coverage before you make your purchase. Analyze which required parts of your rig are covered, and make sure this matches your desired level of risk. Guarantee the program you are thinking about buying will cover the components you expect it to cover. This can be in the form of a list that explicitly states the items that are covered, or in a list that explicitly states the components that will not be covered. This section should be the first thing you review before purchasing. Additionally, look into the total limit of liability the contract will pay in claims for the life of your policy term. Find out how the age and mileage on your vehicle will affect the type of coverage you’re able to get. You’ll want to determine the age and mileage restrictions of an extended warranty to see how your rig stacks up. The most cost-effective option is usually to purchase the longest term available, which could land you between 2 and 7 years, dependent upon the contract and specifics of your coach. Further, there may be age limitations that restrict your level of coverage to something like chassis or powertrain coverage only. It’s important to understand what will and won’t be covered and when. If your rig is on the cusp of policy limitations, you may want to lock in the longest term available, as future coverage renewal is unlikely. Inquire about repair facility restrictions. Look into the requirements for where you can take your RV for repairs under a contract. Some policies will require you to return to your selling dealer, while others may have a specific network of shops you must use. For the sake of convenience, especially if you travel often, we recommend finding a policy that allows you to go to any licensed repair facility in the US or Canada. In an emergency, it’s also helpful when a mobile mechanic is within coverage terms. All in all, you’ll want to ensure that you can take your motorhome to any repair facility and still receive claims coverage. Request the transfer and cancellation terms. Planning on keeping your RV until it no longer runs? Great. This section will most likely not apply to you. However, if you’re thinking of selling or trading your vehicle at some point in the future, you’ll want to ensure there is verbiage in place that will allow for a seamless policy transfer or cancellation. During resale, the addition of an extended warranty can up the overall value of your unit. Make sure you won’t lose your investment if you decide to sell your trailer or motorhome! Investigate that the warranty program is not a Risk Retention Group. Although it’s not always explicitly advertised, some policies are not fully-insured and instead are offered by Risk Retention Groups. Although the price is often lower, these policies often come with much more risk associated. Click here to read more about the difference between a fully insured extended warranty and a policy by a Risk Retention Group. Ask if there are trip interruption benefits included in coverage. Breakdowns and repairs often set you back in ways that you don’t initially calculate. Hotel stays, eating out, even roadside assistance can really hit your travel budget. Supplementary no-cost benefits such as meals and lodging reimbursements are a nice-to-have feature on any policy in the event there’s an issue with your home-on-wheels. Find out how long the coverage will last. 3 years, 5 years, 7 years? Will you be able to renew at the end of your term? Doing your due-diligence when it comes to extended warranties is hard enough the first time around. Make sure you don’t have to start from phase one in the process once the term is up. The ability to lock in long-term coverage at today’s rate, or to easily renew after a shorter term, can save you a headache down the line. Inquire about the post-purchase customer support, and check reviews online! It goes without saying, repairs are tough. Having a claims support specialist that will handle any situation is invaluable. It’s a misnomer that all extended warranties are created equal. Do your research on the company you’re purchasing from, and make sure they will be on your side throughout the entire process. Online reviews are the simplest and most effective way to find out how much support a company will offer before, during, and after you’ve purchased a policy. Resolve if the policy is lower priced due to lower coverage, and decide if this fits your needs. A lower rate on your RV extended service contract can often be linked to less coverage or even a company that is a Risk Retention Group and not fully insured. A lower price could also indicate an incorrectly quoted rate due to the less-than-scrupulous practice of undervaluing your RV. In this case, your warranty wouldn’t hold its full value on paper. In the event your rig needs repairs greater than what the salesperson valued the unit at, you’d be paying out of pocket for all additional costs. Before signing the dotted line on your contract, make sure to get the scope of all additional coverage options that are available. Roadside Assistance is immensely useful in a sticky situation, but it’s not covered in all RV warranties. Beyond that, Tire and Wheel Protection is another valuable option you may want to consider adding into your policy. Purchasing an RV extended service contract can be a decision with almost the same significance as purchasing the rig itself. It’s necessary to gather and understand all accessible information on the coverage you are considering prior to purchasing an RV extended warranty – even if it isn’t through us. At the end of the day, only you can decide what policy is right for you and your home-on-wheels. Consider peace-of-mind and your travel budget in your decision. Will one repair cut your trip short, or do you have enough padding to endure a costly issue? With all of this in mind, you can make an informed decision and look towards the road ahead!